Where most people see trash, Stefanie Nieuwenhuys spies opportunity. After discovering tiny, diamond-shaped wood chips on a workshop floor at Kingston University in London—the leftovers of some architecture student, no doubt—the fashion master's student was reminded of a secondhand snakeskin bag she once purchased. Scooping them up, Nieuwenhuys set to work, layering the wooden scraps onto fabric like reptilian scales. The result is an arresting "biomimetic" collection of corsets, floor-length evening dresses, trousers, and neckpieces that marries modern laser-cutting techniques with a couturier's delicate yet exacting touch. Eschewing virgin resources, Nieuwenhuys worked with bio-waste firm InCrops Enterprise Hub in Norwich to obtain discarded pieces of plywood, which she then laser-cut into precise forms. Glued onto unbleached organic cotton, the brown-and-ecru “scales” created a “simulacra of nature, without discarding nature’s inherent harmonies,” she tells Ecouterre. 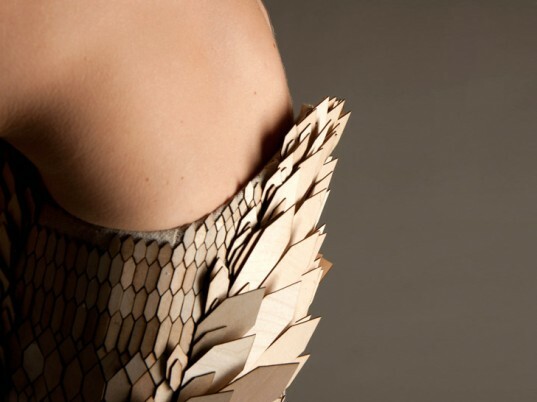 Nieuwenhuys worked with a bio-waste firm to obtain discarded pieces of plywood, which she laser-cut into precise forms. Nieuwenhuys believes in creating designs that are not only timeless but also keep traditional craftsmanship alive. “I believe in using what you have available and letting nothing go to waste,” she says. Eschewing virgin resources, Nieuwenhuys worked with bio-waste firm InCrops Enterprise Hub in Norwich to obtain discarded pieces of plywood, which she then laser-cut into precise forms. Nieuwenhuys believes in creating designs that are not only timeless but also keep traditional craftsmanship alive. "I believe in using what you have available and letting nothing go to waste,” she says. The collection, comprised of recycled plywood, is both sustainable and durable. "In this collection I used discarded plywood to create a collection of pieces that speak to both the fashion forward and the environmentally conscious," Nieuwenhuyse adds.